I’m not much of a baker. This time of year, however, I get the itch to get out the flour and make a colossal mess of the kitchen. That, and it’s a great way to spend time with my daughter, who loves to bake. We crank the tunes, yip our heads off, and have a jolly old time. The other day we tried our hand at making pulla, a Finnish cardamom bread. Our family calls it “boo-la”, but my daughter refers to it as “Buddha.” She associates my aunt’s house in Montana with “Buddha bread,” and she can’t get enough of it. As we were kneading the dough, I thought of my grandmother, whose famous Finn bread was one of my childhood staples. Instead of using a measuring cup, she’d scoop handfuls of flour into the bowl with her hands. She’d pour salt into the crook of her elbow in lieu of a measuring spoon. And her bread, warm from the oven and slathered with butter — Sally, bar the doors. Over the years, the memory of that taste has become the stuff of legends. She’s been gone a long time now, but whenever I make Finn bread, I feel close to her. Wishing you a glorious holiday season chock full of schmoopy moments! What are some of your family traditions this time of year? 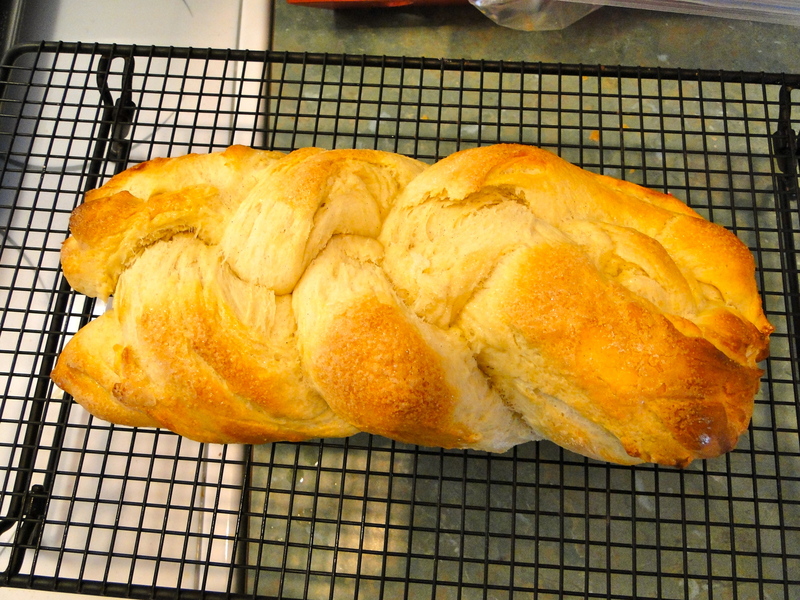 This entry was posted in Uncategorized and tagged Finn bread, Pulla, traditions by Beth Christopher. Bookmark the permalink. why are you trying to make a guy cry this morning?? I’ll believe that when I see it, Hugh. 😉 Hugs to your beautiful family! Yes she will think of someone, probably her Mama and she will have lots of wonderful memories cause you are a good one. I made our Aunt Edith’s chocolate cake for work the other day. Do you remember it? Makes me feel close to her. Thanks Kath. I do remember Edie’s “sinful chocolate cake.” Mom made it a lot and I’ve made it a few times, too. It’s dangerous! Do you remember anything else she made? I remember her rolls that she’d bring to your mom’s house for Thanksgiving or Christmas.